Jason Manford will be appearing at the Grand in December. A Lancaster theatre is becoming a popular hub for comedy within the city as it attracts big names in sell-out shows. 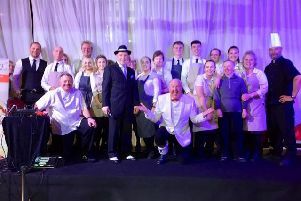 This year the Lancaster Grand Theatre has attracted a host of star-studded comedians who are ready to take to the stage in the name of laughter. In May alone the Grand is welcoming Al Murray, Andy Parsons, Stewart Francis, Justin Moorhouse, Jarred Christmas, Jim Tavare and John Bishop. “I have had a lot of people ringing me up asking how are we doing it, how are we getting these big names?” said Ellie Singleton, theatre manager. “I think it is because I have just built up a good relationship with them over the years. Al Murray - the pub landlord will be bringing his show, ‘Let’s Go Backwards Together’ to the Grand on Wednesday May 10 at 7.30pm. Andy Parsons will be appearing too on Friday May 12 at 8pm. The BBC Mock The Week star will be performing his show, Peal Bullsh*t to the crowd. Tickets cost £15, the show is recommended for anyone aged 14 and over. The All-Star Stand Up Tour will also be dropping in on Monday May 22 at 7.30pm. This year’s line-up includes Canadian one-liner king Stewart Francis, fro mPhoenix Nights and 8 Out Of 10 Cats, Justin Moorhouse and the BAFTA award winning Jim Tavare. Tickets acost £22. Liverpool funny man John Bishop will be appearing at the Grand for four nights from May 23-26 with his show Winging It. Tickets have now sold out though. Meanwhile Manchester comedian Jason Manford announced his one-night show at the Grand and within twenty minutes tickets at the box office and on the website sold out. But don’t worry if you still want to see the funny man there are some tickets left on www.ticketmaster.co.uk/. He will be appearing on Thursday December 14 at 7.30pm. Theatre manager Ellie Singleton has said the theatre will soon be revealing other big comedian names who will be appearing this year and early 2018. To buy tickets for the above shows please call the box office on 01524 64695 or visit www.lancastergrand.co.uk/shows.